The mechanized opening of Jacques Tati’s 1971 film Trafic has a strangely calming quality to it. Despite being set on a noisy factory floor filled with massive machines and working men, the film’s title sequence is an orderly and deliberate affair, much like the vehicle assembly line at its centre. Beginning with the scrape of a cymbal as two workers position a sheet of metal, the first credits are revealed in between the rhythmic clonks of an enormous hydraulic press. The sequence is nearly silent, save for the occasional whistle and the sound of machinery. 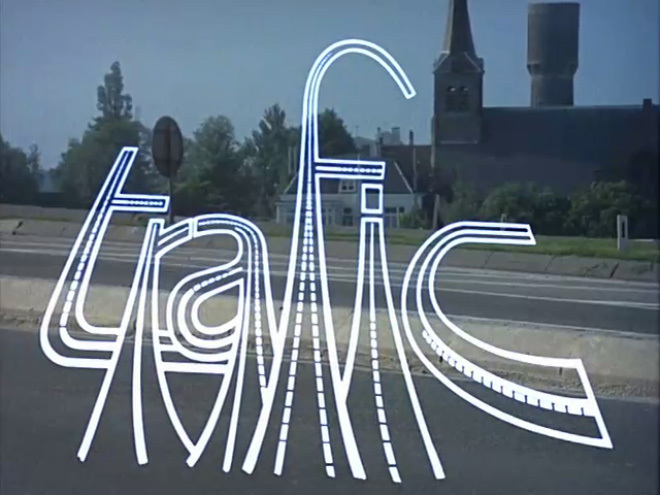 Prolific French title designer Michel Francois uses the film’s title card – designed to evoke the tangle of motorways and off-ramps that are the film’s backdrop – to establish a vehicular theme as viewers watch automobiles take shape on the conveyers. The remaining credits, set in Volta Stencil and that oh-so-familiar shade of standardized yellow, drive the point home – or at least down the road to get gas and groceries. This is a movie wholly concerned with cars and their impact on our modern lives. 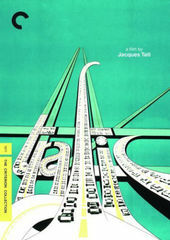 The fourth and final outing of the famous Monsieur Hulot character, Trafic puts the bumbling Hulot (played as ever by director Tati) in the role of an automobile designer. Tasked with bringing his company’s newest product – a gadget-filled “camping car” RV – to an important auto show in Amsterdam, Hulot embarks on a chaotic road trip across Europe. The Trafic opening title sequence acts as the calm before the honk-filled storm.